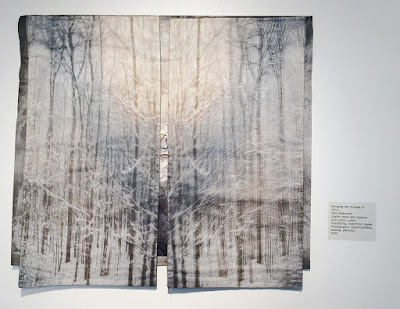 The latest style-oriented blogs, magazines and websites are abuzz about hygge. You may have even seen the bestselling books on the subject at your neighborhood bookstore. Hygge (pronounced hoo-guh) is a Danish word. It has no true English translation, but it describes cozy, contented times spent with good friends and family. The hygge lifestyle is homey, relaxed, unpretentious, and intimate. Because of our state’s strong Scandinavian roots, it’s no wonder that the Etsy shops of HandmadeMN makers are filled with handcrafted goods that express the hygge way of life. 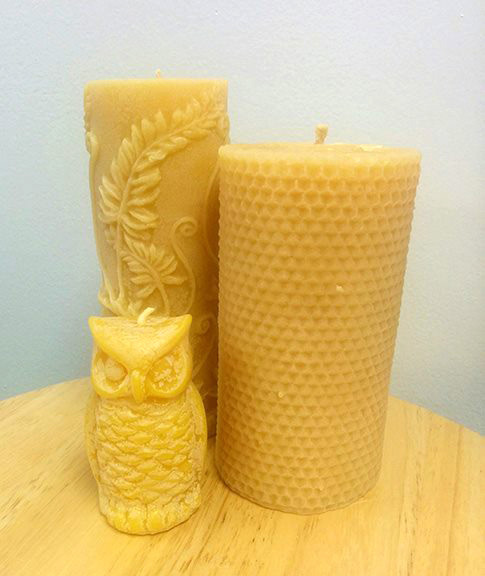 Consider these items to add a little hygge coziness to your space. 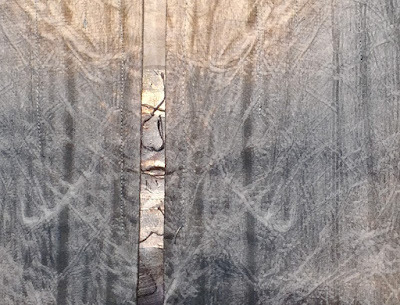 This OpenCupboardDesigns paper luminary offers nature-inspired beauty and light, perfect for evening conversation and relaxation. 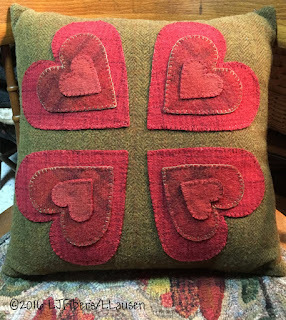 A pillow adorned with fabric hearts by woolyredrug provides any room with the warm, handmade coziness we associate with hygge. 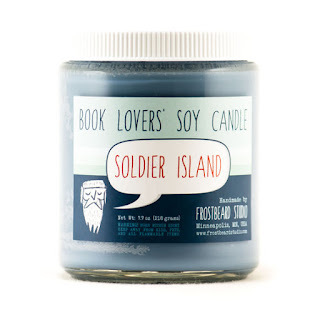 This soy candle by Frostbeard will fill your space with the serene scents of the ocean. Where's Soldier Island? If it smells this good, buy me a ticket! Being at one with nature is a hygge must. 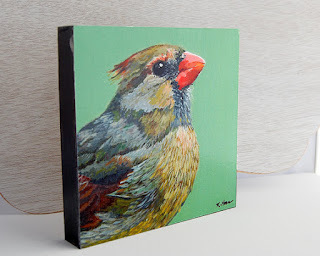 A female cardinal print by ArtProjectStore brings nature inside, where you and your loved ones can enjoy it throughout the day. 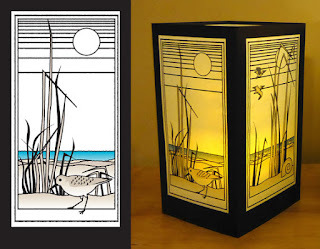 Because it's printed on a wood block, this piece will add dimension to a wall display, or look lovely on a shelf. Another important part of the hygge way of life is spending time doing things that bring you joy and contentment. 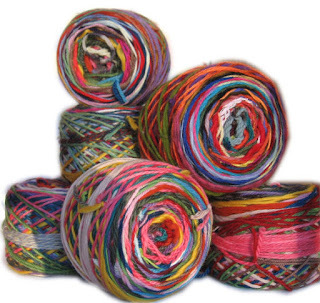 Delightful balls of wool scrap yarns from myfriendlondon will provide hours of enjoyment as you create your own handspun creations infused with relaxed beauty. Hygge inspires us to enjoy the day-to-day moments of our lives, to be fully present, and to appreciate the people and things that surround us. 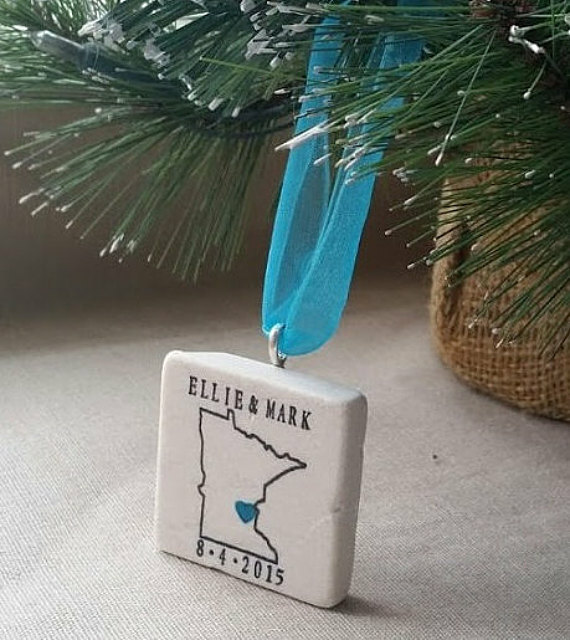 Peruse the many Etsy stores of HandmadeMN artisans for even more ideas to integrate the hygge philosophy into your daily lifestyle. 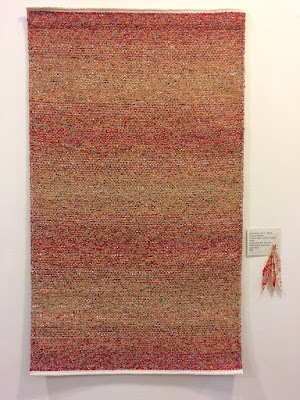 Would you believe she consigns about 150 local artists?! It's true. Meet the owner of Doodle Bird Design + Gift, Kristin Knych. First off, give us the address and hours of your cool shop. We’re located at 2803 E 42nd St in Minneapolis. 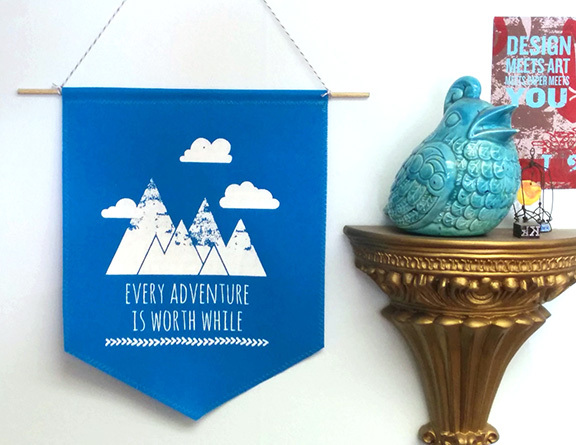 So Doodle Bird is two parts: Design + Gifts. Can you explain? I’m a freelance graphic designer by day and avid crafter by night and working out of my little house with a boyfriend and two cats was getting tight. 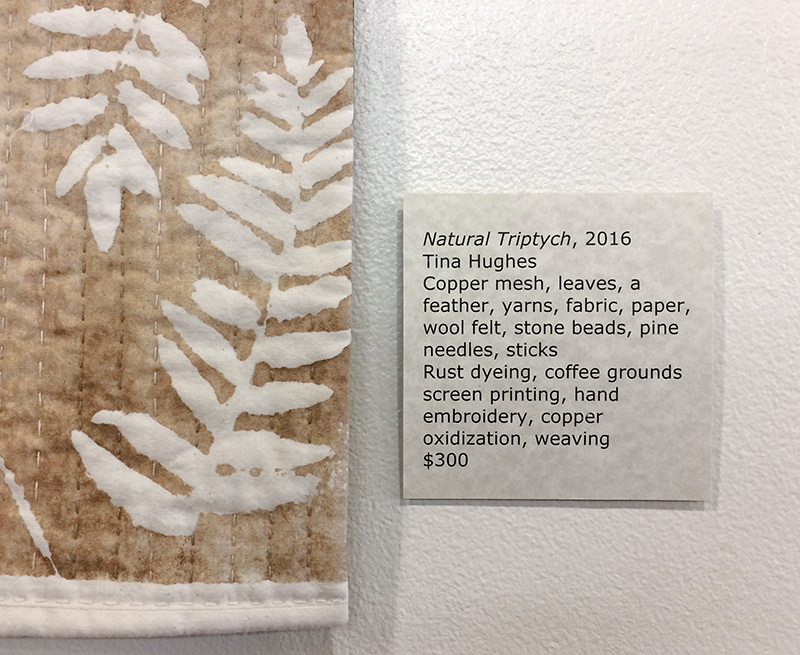 The thought occurred to me that to help offset the cost of having a studio space I could have a gift shop in the front - two for one. It works out really nice. When the shop isn’t busy I can work on my design projects and when I feel like being crafty, I don’t have to clean up my kitchen table every night. 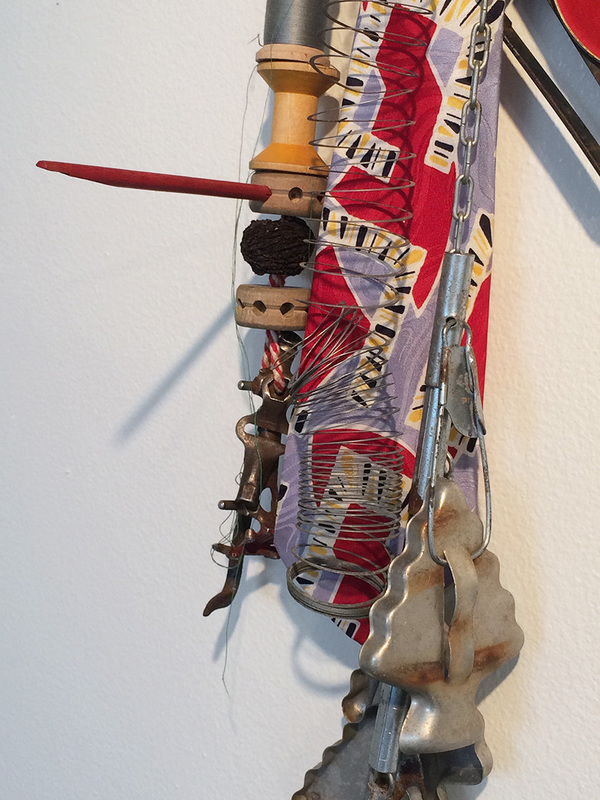 Why did you want to carry other local artists besides your own fun art? I know first hand how hard it is to be a small, independent artist so if I could help out other creative people in some way I wanted to give it a try. 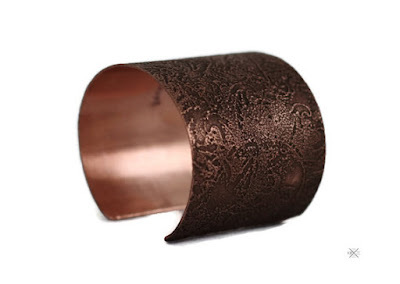 It’s nice to have a brick and mortar space to sell things when etsy is slow or it isn’t craft show season. 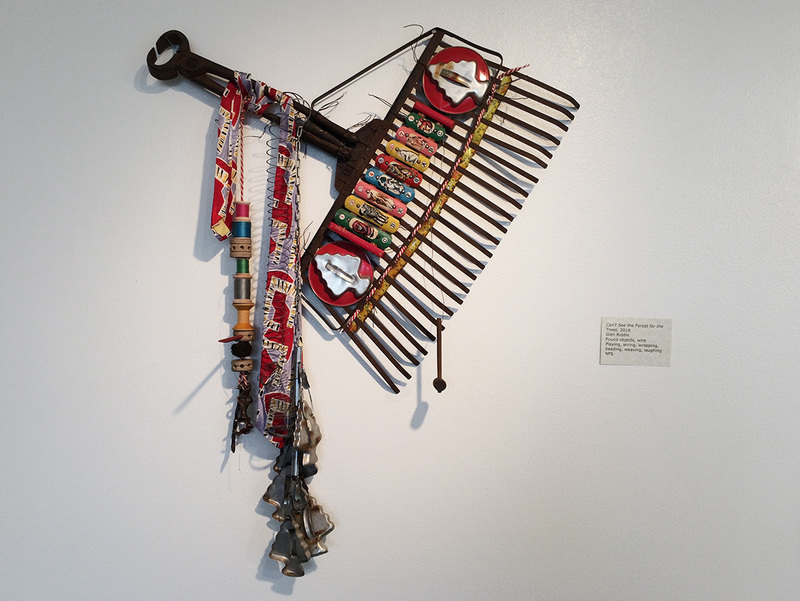 How many artists do you carry? 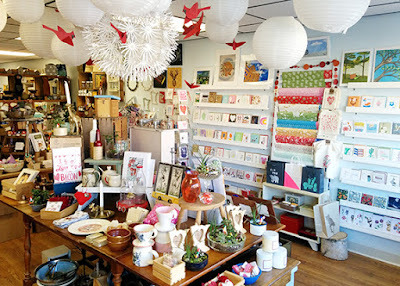 I’d say there are close to 150 artists currently in the store, including several from HandmadeMN. 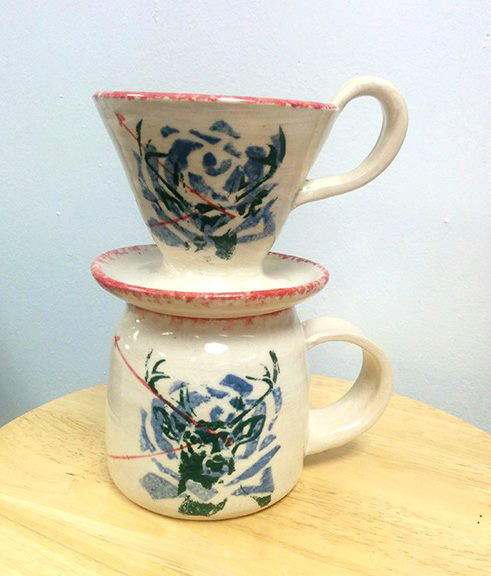 Please give us some examples of the art and artists in your shop. 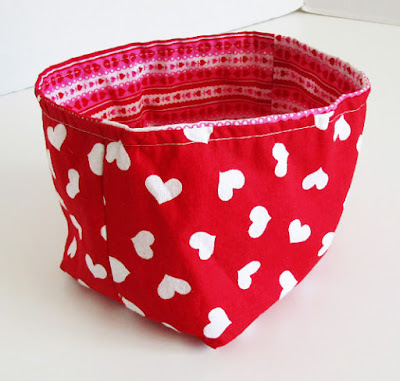 What do your customers like about the handmade local items you carry? So many people tell me how nice it is to have a little gift shop in the neighborhood where they can buy quality, one of a kind items. And they love the fact that they’re helping local artists. What's the best part of your job as entrepreneur? Getting to meet all the different artists and being inspired by their creativity. So after customers shop at Doodle Bird Design + Gifts and support us local artists, what other fun places are there to check out in your neighborhood? My favorite is The Baker's Wife across the street from you. I’d second that about the Baker’s Wife but there are several other places to visit on the corner as well. You can grab a burger and a beer at Buster’s on 28th, get a coffee or have your bike tuned up at Angry Catfish Bicycle + Coffee Bar or buy some outdoor gear at Mend Provisions. There’s a little something for everyone. 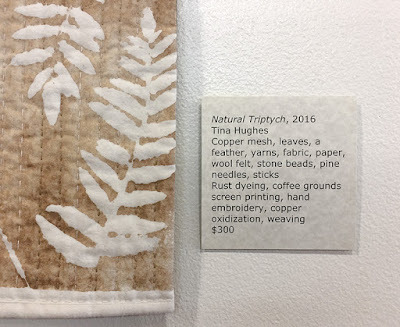 The Textile Center's annual member show, A Common Thread, features works from 136 artists, showcasing the skill and ingenuity of the member artists. 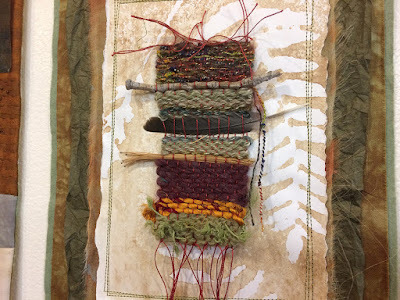 Members were invited to submit one work each, with no restrictions as to theme or techniques. The resulting display offers delightful variety as it meanders throughout the public spaces, greeting a visitor almost immediately upon entering from the parking lot into the back hall; it lines the walls of the central hallway as you walk past the library, and fills the gallery at the front. 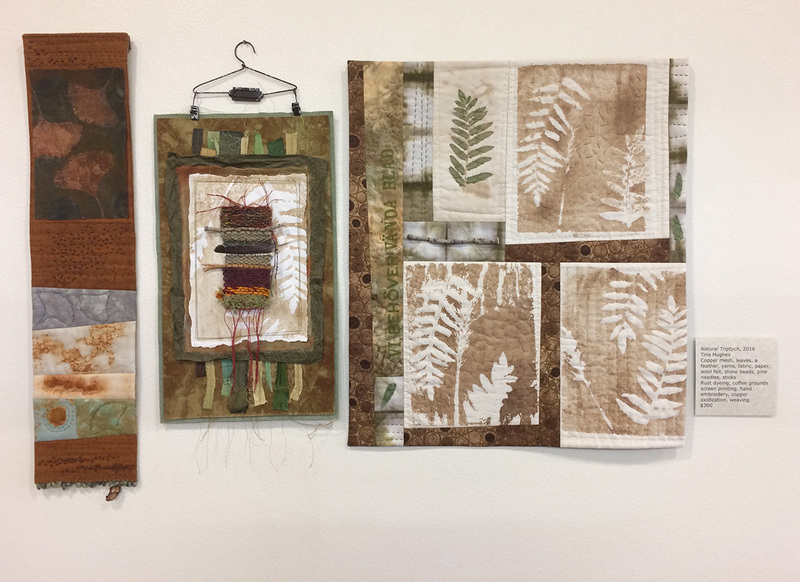 Here are just a few of the items on display, including two from HandmadeMN members, Margaret Mousley and Mary Pow, which begin and end the selections included here. 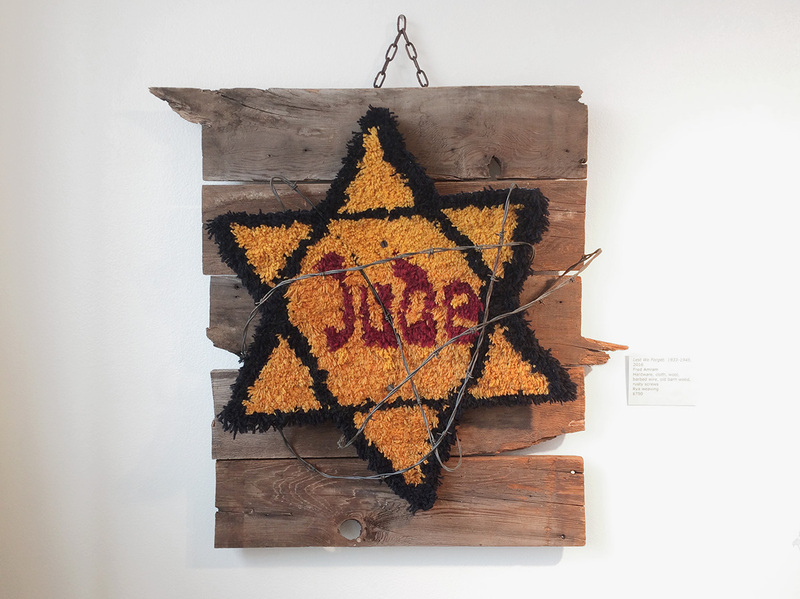 I highly recommend you go and see all of them for yourself. 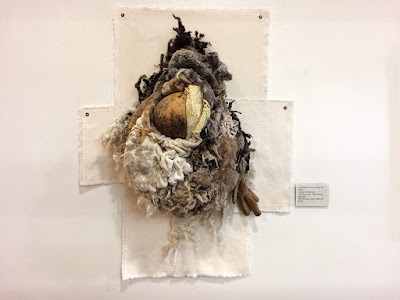 The show continues until Feb. 25 at the Textile Center of Minnesota, 3000 University Ave., Minneapolis. Rounding the corner from the back to the center hallway, one encounters this elegant dress and jacket (directly behind the dress) designed and made by HandmadeMN team member Margaret Mousely. 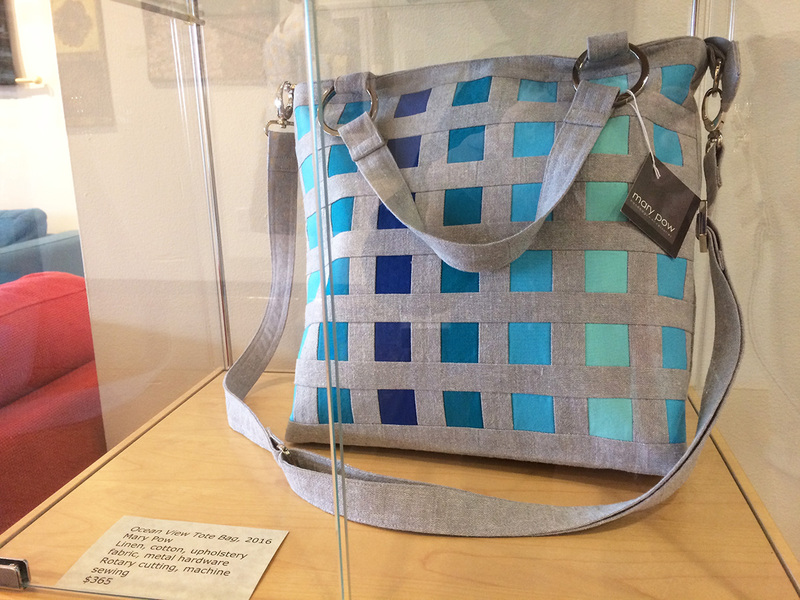 and made, currently on display at the Textile Center. 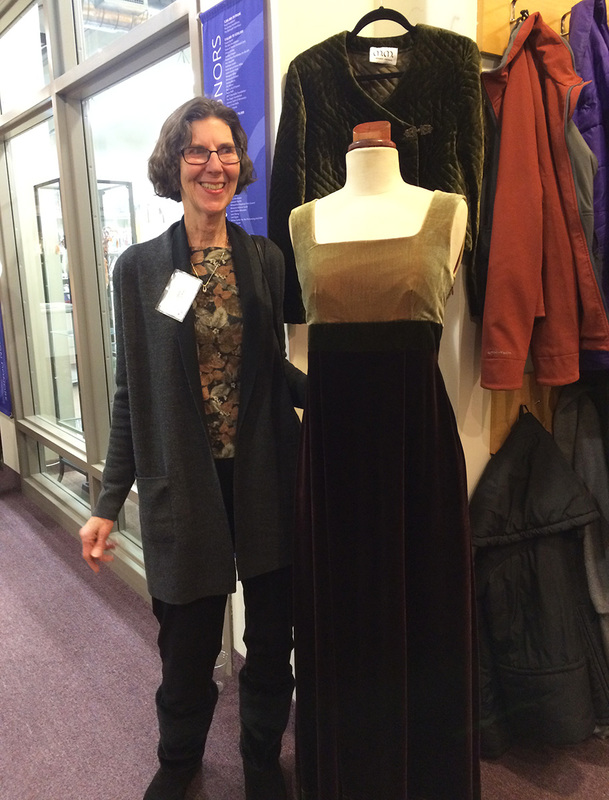 “I made this dress for my niece because she was the bridesmaid for my daughter’s wedding," says Margaret. 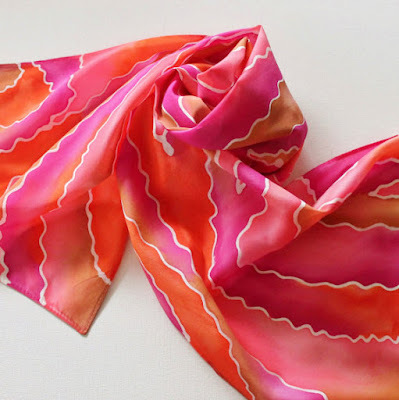 "It was a Fall wedding, so I used silk velvets in autumn colors. Her husband and his family came from Korea, and I wanted to include that culture. There was a Korean fashion show at the Mall of America that year, so I went to see it. 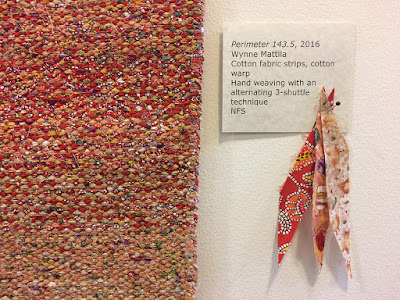 The quilted jacket, shorter bodice, long skirt, and color bands are my interpretation of it. 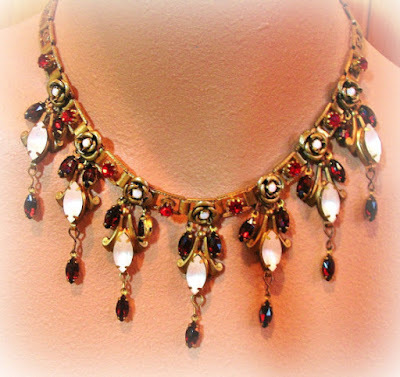 I incorporated this into the wedding dress and the flower girls’ dresses also. Margaret's business is designing travel wear, which she sells through her website, GoTravelWear.com, and via her Etsy shop, Margaret Mousley Designs, which also includes a couple of unique purses she made from recycled fabrics. 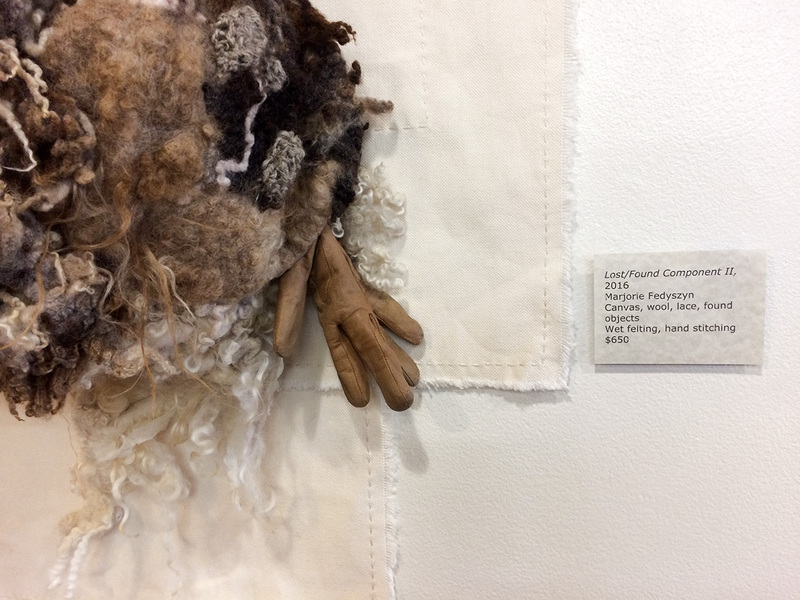 Most of the works in the show were not functional items, like clothing, but intended for display. 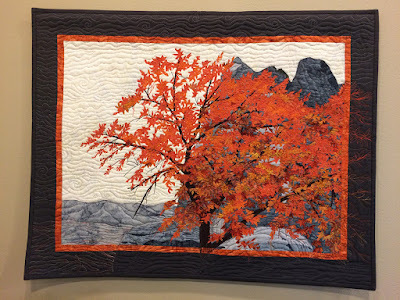 Some used quilting techniques, from piecing to topstitching and applique, like this wall hanging by Emily Chesick, titled "Autumn Tree II." 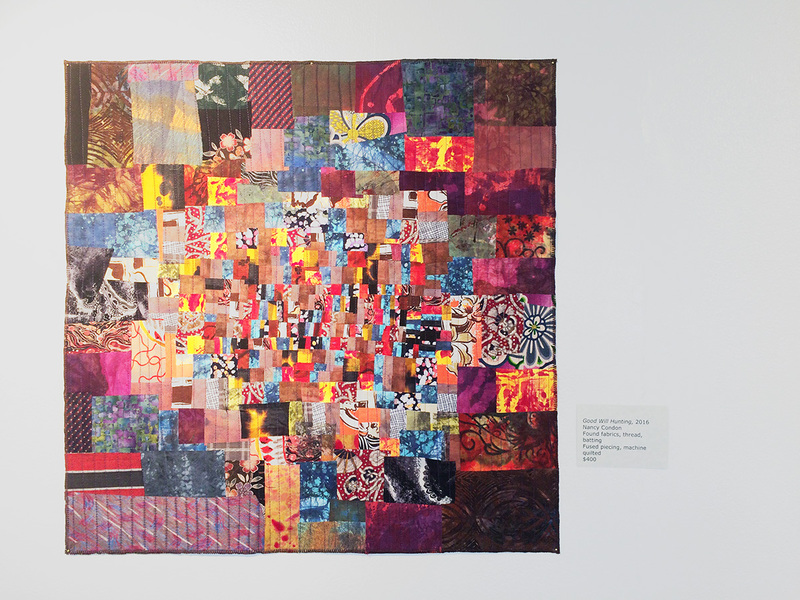 Another pieced and quilted work is "Good Will Hunting" by Nancy Condon. This one was made with fused piecing and machine stitching, and incorporates "found fabrics." 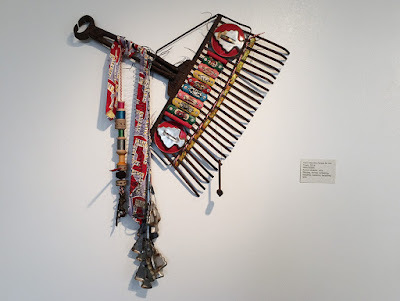 In fact, I noticed a common theme in may of the works on display, which was the use of found objects and repurposed materials, sometimes called upcycling. 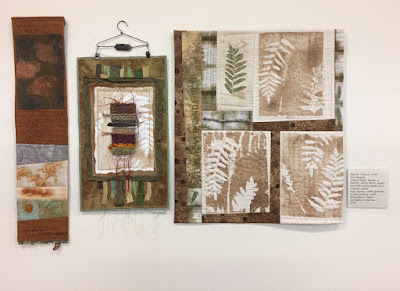 Below, this mixed media work by Tina Hughes includes an assortment of natural found objects, which were all listed on the tag. I enjoyed looking for the items, like a visual scavenger hunt. Detail from "Natural Triptych." 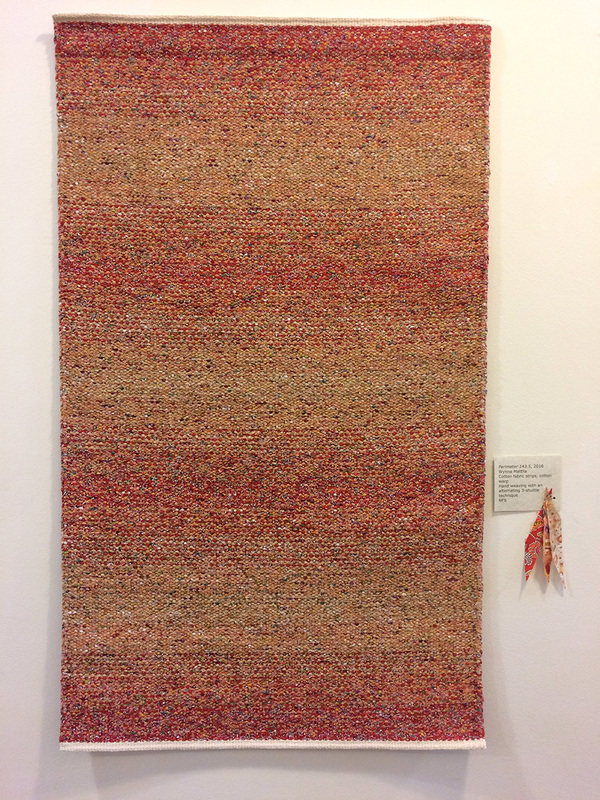 Can you spot the feather? 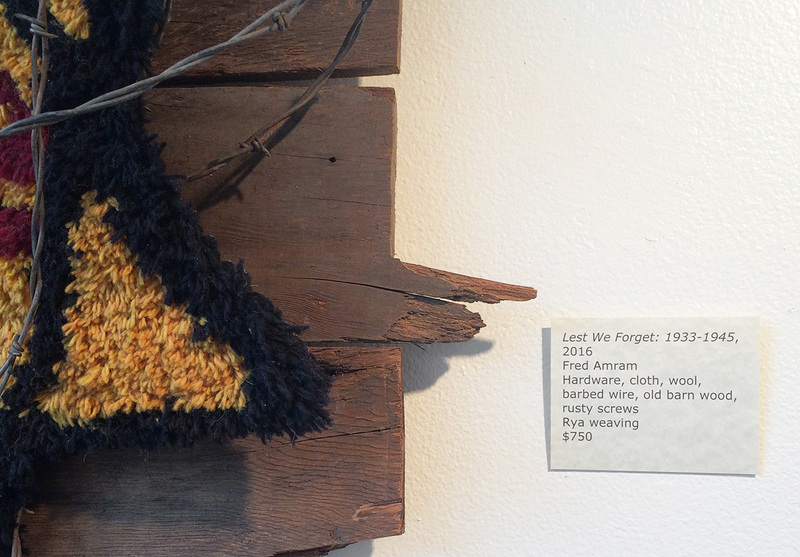 "Lest We Forget" by Fred Amram delivers a powerful message with bold materials, including barn wood and barbed wire framing a skillfully woven tapestry. 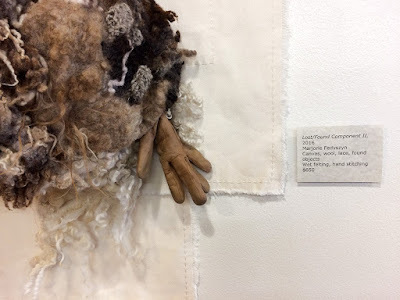 Detail and tag for Amram's piece. "Lost/Found Component II" by Marjorie Fedyszyn playfully incorporates several random found objects into a large quirky and exuberant ovoid attached to an asymmetrical crosslike canvas backing. 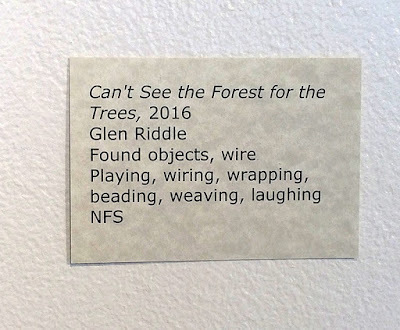 Glen Riddle wins the "Most fun use of found objects" prize with "Can't See the Forest for the Trees," which pushes the boundaries of what counts as textile arts in a very entertaining way. 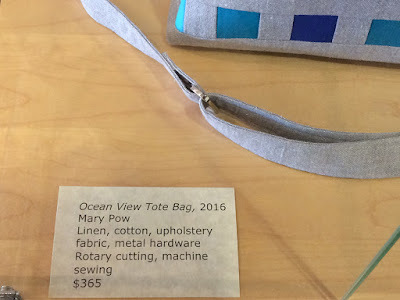 Even his tag listing the components has a playful twist. 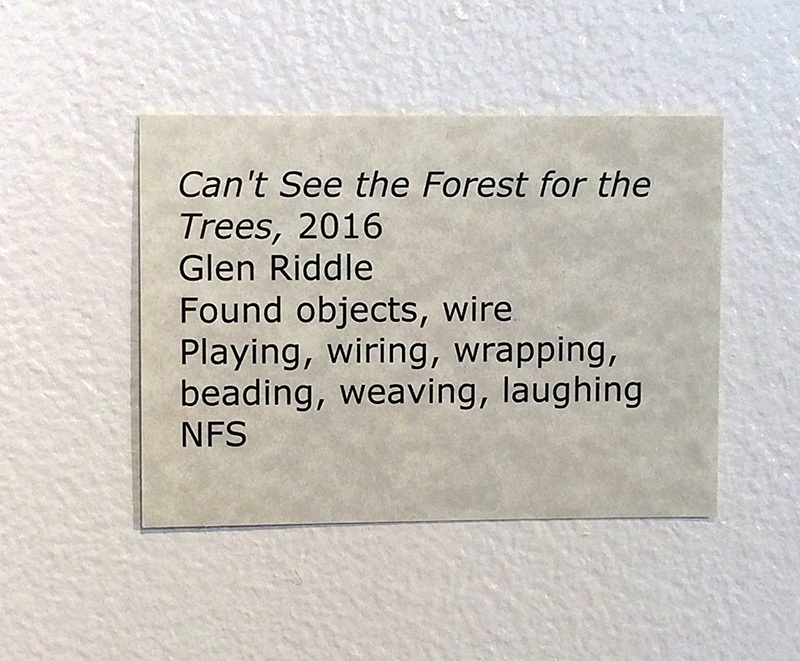 "Can't See the Forest for the Trees," by Glen Riddle. But let's not get too carried away with silliness, fun though it is. 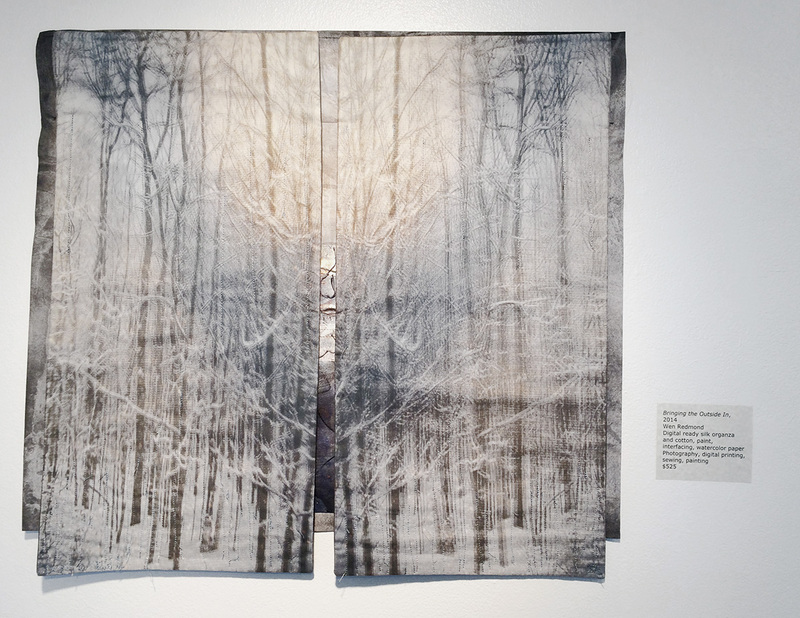 Other works exhibited more understated beauty as well as obvious skill, such as "Perimeter 143.5," by Wynne Mattila. 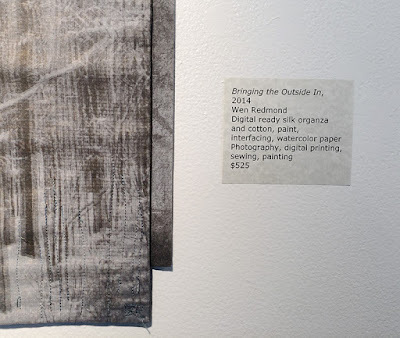 Detail and tag from "Perimeter"
In "Bringing the Outside In," Wen Redmond used digital printing along with painting and photography on silk to create a visual story that looks like somebody peeking out between curtains. Or are they peeking in? Detail and tag for "Bringing the Outside in"
Another detail from the center of the work. And now we come round to another HandmadeMN member, Mary Pow, and another example of exquisitely designed and crafted functional art, with "Ocean View Tote Bag." 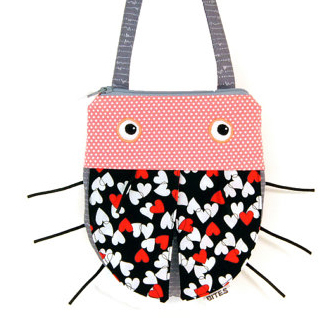 Find more finely crafted bags and pouches at Mary Pow Designs and in her Etsy shop, Minnebites, which also features cute pouches and pencil cases in the shapes of fish, sharks, ladybugs, and more. That's the end of my tour. 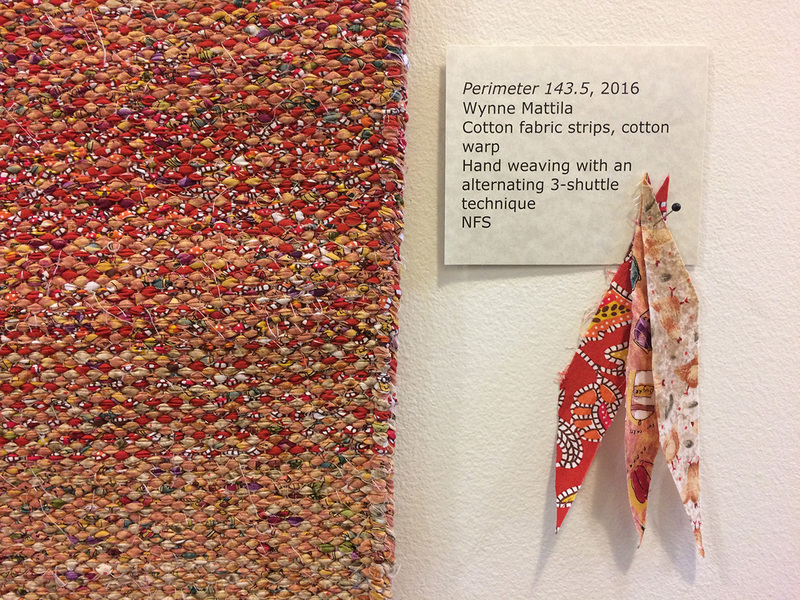 I do hope you manage to get over to the Textile Center to see the member show for yourself! Our team offers their best Valentine gift ideas and home decor for you. 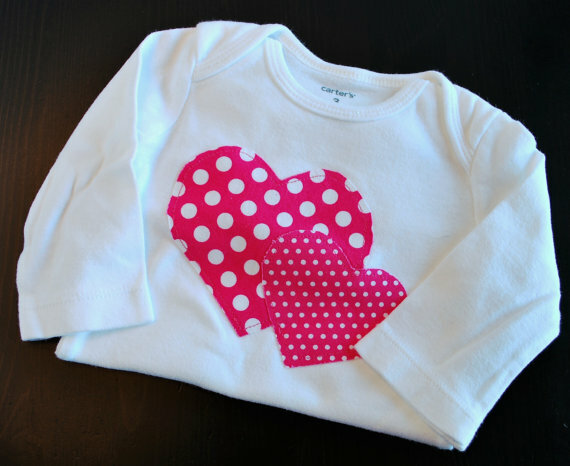 Some shops can even personalize the items just for that special person. 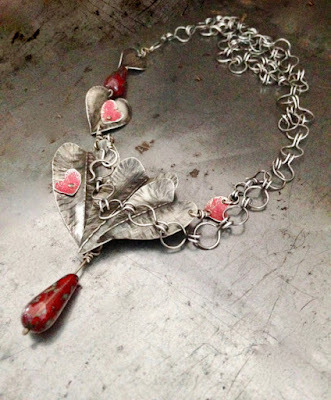 Give a handmade gift of love this year. 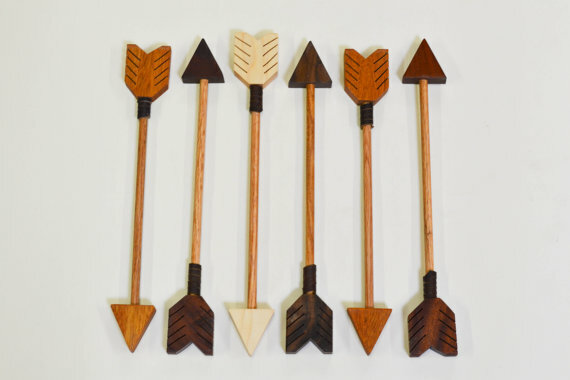 Oak Tree Arts offers these decorative Wooden Arrows. A stunning necklace by Gemnorde is sure to please. 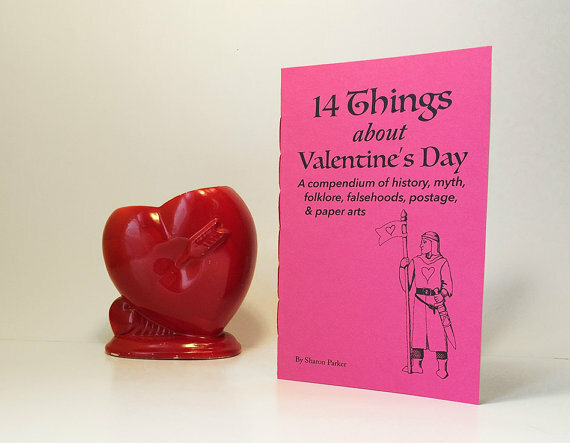 For nerdy types or history buffs, Sharon's Compendium offers this gift book. 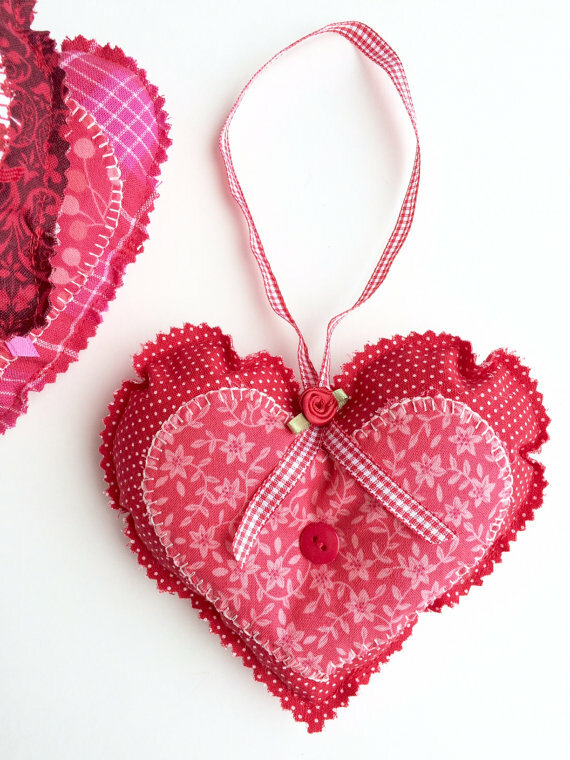 Decorate your home with these Hanging Hearts made by Bound to be Creative. A gorgeous Hand Painted Silk Scarf by Palettepassion will brighten their day. Sweet and special littles for your loves by Kaleidoscope Kitty Custom orders are welcome. Chatter by Hammer offers this handcrafted personalized copper Cuff for that special someone. 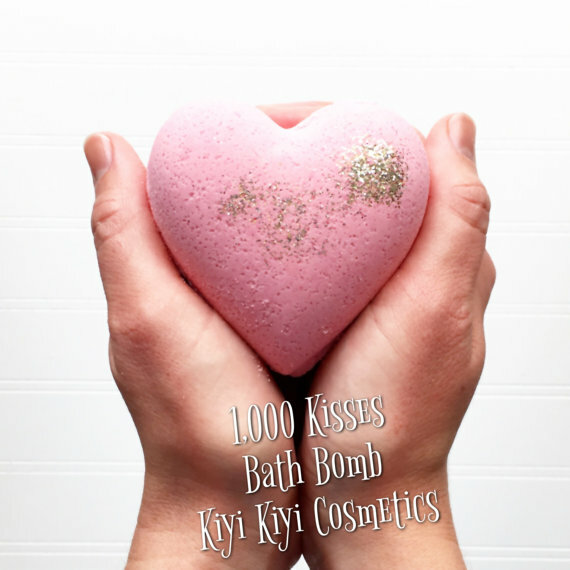 They will appreciate a Heart shaped Bath Bomb by Kiyi Kiyi. 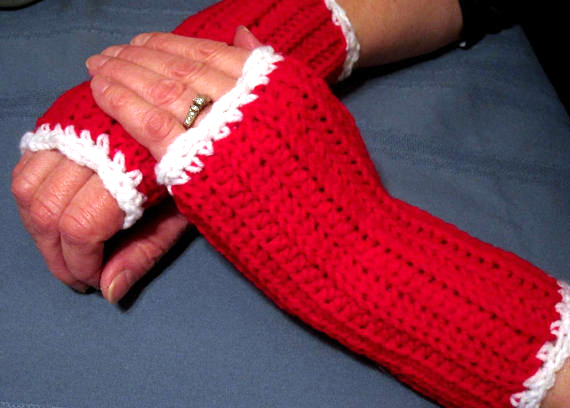 Texting Gloves by Susie B Handicraft will be appreciated. 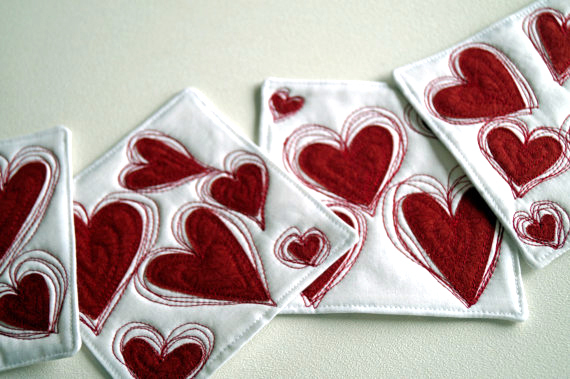 My Bit of Wonder offers these fun Quilted Fabric Coasters. 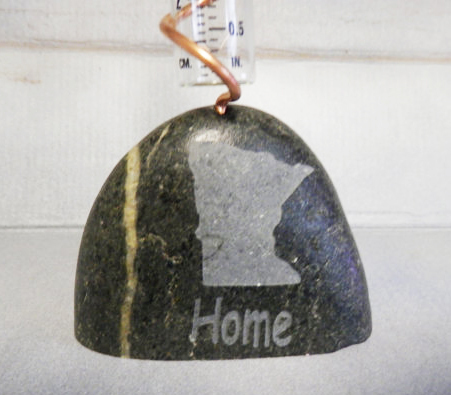 These Lake Superior rock rain gauges can be customized with a heart or initials. 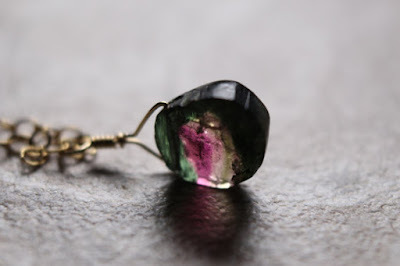 Inquire with Naturally Unique Rock. Metaling Susie hand crafts this Sweetheart Necklace for your special someone. Bethie Ann Baby offers Valentine Onesies for your little Valentines.